Although, not loud and screeching,… Laura Bush‘s words carry quite a punch. Laura might as well have been kissing Hillary’s forehead, the way she rebuked Hill’s ridiculous remarks with style and grace on her day of visits with AIDS patients in Nigeria. “It think it’s ridiculous _ it’s a ridiculous comment,” Mrs. Bush told reporters when asked about the remark during a return flight to Washington following her four-day swing through West Africa. Mrs. Bush, who said her next trip likely will be to New Orleans to visit schools damaged in the hurricane, also reacted to a comment by New Orleans Mayor Ray Nagin that stirred controversy. Nagin had said: “This city will be chocolate at the end of the day.” He later apologized. Asked about the comment, Mrs. Bush joked that she didn’t really think she could speak for God. Then she added that she believes Nagin wants New Orleans to be rebuilt. Drudge carried the story today. There is more of the press conference with First Lady Laura Bush at the White House website. 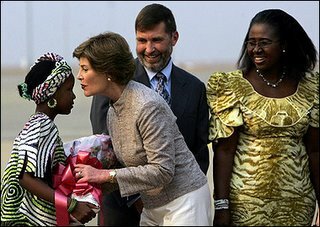 Laura Bush was in Nigeria on Wednesday pledging AIDS funding and speaking out on women’s issues. On Monday, at the inauguration ceremony of Africa’s first elected woman president, Laura Bush said Condi was her choice for president. Michelle Malkin has more on the Democrats Day of Demagoguery, HERE. Driftwood found that this is not the first time Hillary has used the plantation comparison.